12 3/4 x 6 x 6 in. 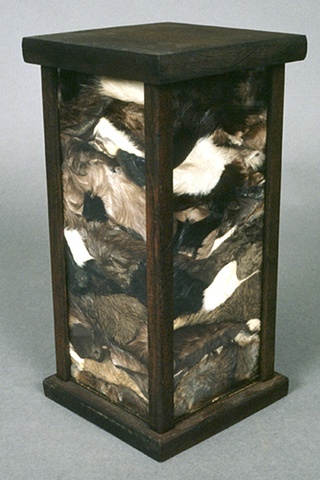 The discarded remnants of animal furs are contained in a vitrine. Various species of skins uncomfortably press against the glass sides. The black, brown, and white fur are cramped into a small space that make irregular horizontal lines, alluding to the lines of a book or vellum used as a material to write on. Instead of a verbal language the reader might use to understand the narrative, in this case the striations form an archeological uncovering, a tell or pictograph. The title of the piece, Skins, not only refers to the obvious material of animal fur but alludes to the indelible images from photographs of dead bodies stacked on cement floors; Jews murdered in gas chambers during the Holocaust and irreverently tossed, like refuse, into sunken graves.